If you notice bleeding or sore gums when you brush your teeth, floss, or when you spit in the sink, it’s a sign of gingivitis or periodontal (gum) disease. If you catch the disease early, it is easy to treat and even reverse, so it’s very important that you mention it to your dentist. Simple treatment for bleeding gums may include switching to a softer tooth brush or using a special mouth rinse. More frequent visits to our office for professional teeth cleaning can also help to more effectively remove plaque and tartar from the teeth and gums which can cause bleeding to occur. 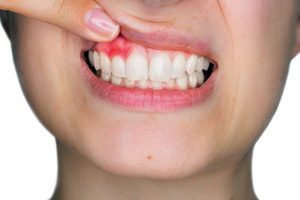 How do bleeding gums progress to gum disease? If left untreated, bleeding gums can progress beyond gingivitis to serious gum disease. Three out of four adults are affected by gum disease, which is the leading cause for tooth loss. If you develop gum disease, a more advanced form of treatment is warranted. Your dentist will perform deep tissue cleaning, and in some cases, surgery may be necessary.